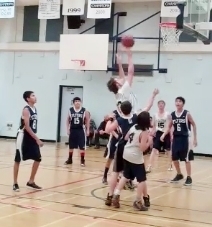 Matthew Halton School's A and B Boys Hawks basketball teams hosted their F.P. Walshe Flyers counterparts on Thursday evening, December 19. It was the first game of the season for both Hawks squads after games were cancelled earlier in the month due to poor weather. The Flyers teams dominated both games, winning by considerable margins. The A Hawks were well behind by the final quarter of their game, up against a Flyer's team that proved to be quite adept at intercepting, controlling the ball, and making the most of their opportunities. However, in that final quarter the Hawks began to gel, taking it to the basket more often and scoring more often as well. They began closing the gap, but it was an insurmountable gap, and the Flyers won it 50-22. Hopefully the weather will cooperate a little more in the new year so the Hawks can get more game-time experience.